Fitted with its new compound eye on the heavens, the National Science Foundation's (NSF) Arecibo Observatory telescope, the world's largest and most sensitive single-dish radio telescope, is beginning a years-long survey of distant galaxies, perhaps discovering elusive "dark galaxies" - galaxies that are devoid of stars. Astronomers at Arecibo Observatory hope the new sky survey will result in a comprehensive census of galaxies out to a distance of 800 million light years from our galaxy, the Milky Way, in nearly one-sixth of the sky - or some 7,000 square degrees. The search, conducted by an international team of students and scholars, is the first of a series of large-scale Arecibo surveys that will take advantage of a the telescope's new instrument, installed last year, called ALFA (for Arecibo L-Band Feed Array). The device is essentially a seven-pixel camera with unprecedented sensitivity for making radio pictures of the sky, allowing astronomers to collect data about seven times faster than at present. The project has been dubbed ALFALFA, for Arecibo Legacy Fast Alfa Survey. "Fast" does not refer to the time necessary to carry out the survey, which will require thousand hours of telescope time and a few years to complete, but rather to the observing technique, which consists in fast sweeps of broad swaths of sky. The survey is supported by the National Astronomy and Ionosphere Center (NAIC) at Cornell University, Ithaca, N.Y., which manages the Arecibo Observatory for the NSF. In addition, support is being provided through research grants from the NSF and the Brinson Foundation to the project's leader, Cornell professor of astronomy Riccardo Giovanelli, and to Martha Haynes, a Goldwin Smith Professor of Astronomy at Cornell. Giovanelli explains that ALFA operates at radio frequencies near 1420 MegaHertz (MHz), a frequency range that includes a spectral line emitted by neutral atomic hydrogen, the most abundant element in the universe. ALFA detects this signature of hydrogen, which hopefully signals the presence of an undiscovered galaxy. Nearly every previous sky survey has been of optically, infrared- or X-ray-selected galaxies. ALFALFA will be six times more sensitive - meaning that it will go much deeper in distance - than the only previous hydrogen wide-field survey carried out in Australia in the late 1990s. "What has made ALFALFA possible is the completion of the Gregorian upgrade to the Arecibo telescope in 1997, which allowed feed arrays to be placed in the telescope focal plane and expanded the instantaneous frequency coverage of the telescope," he says. Besides providing a comprehensive census of the gaseous content of the near universe, ALFALFA will explore galaxies in groups and clusters and investigate the efficiency by which galaxies convert gas into stars. What particularly intrigues astronomers is that ALFALFA could determine whether gas-rich systems of low mass that have not been able to convert their cosmic material into stars - the so-called dark galaxies - actually exist. Because these galaxies, being starless, are optically inert, it is hoped that they can be detected by their hydrogen signature. The galaxy survey is feasible now because ALFA lets the telescope see seven spots - seven pixels - on the sky at once, greatly reducing the time needed to make all-sky surveys. The Australian-built detector, on the 305-meter (1,000-foot) diameter Arecibo radio telescope, provides the imaging speed and sensitivity that astronomers will need for their search. 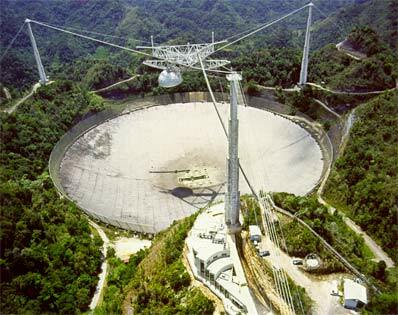 Robert Brown, the NAIC's director, said that a significant fraction of the Arecibo telescope time in the next few years will be devoted to extensive surveys with the ALFA array, such as ALFALFA. The new survey consortium consists of 38 scientists from 10 countries, including the United States, France, the United Kingdom, Italy, Spain, Israel, Argentina, Chile, Russia and the Ukraine. Several of the members are graduate students who will base their Ph.D. theses on ALFALFA data. Among them are Cornell graduate students Brian Kent, Sabrina Stierwalt and Amelie Saintonge. Says Giovanelli: "My one and only paper published in an engineering journal proposed the construction of a feed array at the upgraded Arecibo telescope to carry out hydrogen line surveys of the sky. It took 15 years of waiting, but I am finally going to do the experiment."